Did I miss a week? Whoops. Guess what? I can swim!! My shoulder was much improved with a course of prednisone so that it wasn't sore all the time like it had been. I was even able to start sleeping on my tummy again. Ahhhhhh. So I had to make a decision about this Raro tri. I started off with a 200m swim which I was able to do with a bit of discomfort so I went ahead and confirmed my entry for Raro. Since then I have done a couple of pootley swims of around 1200m-1500m without too many issues. Its not fantastic but isn't sore afterwards. I am slightly paranoid that my semi-wasted rotator cuff muscles are going revolt against me and start to cause an impingement from swimming so I'm not going to be silly about it. I'll take stock after Raro and start some exercises and hopefully start building up the swimming nice and gently and see what happens. My poor little shoulder blade is looking a bit bonier than usual but it isn't too obvious luckily and my arm is definitely weaker when I lift things. A few random things like pulling off gloves and putting Jared's car in gear is a bit harder but so far there doesn't seem to be anything that I can't do which is good news. BIG week on the bike over Easter for Big Jo. Not really intentional but the weather was good so why not. Hot Cycles had organised a 140km ride on Good Friday which was a pretty easy way to get some km's in. It was the longest I had spent on my bike since Ironman and other than a bit of a fidgey-widgey shoulder it was pretty good. The next day was a bit more difficult and my leggies started to feel very sad after about 2.5hrs but luckily Uncle Roy was understanding and didn't try to hurt me too much. He even bought me a Red Ambulance to keep me going. The next day my legs were very, very sad but we only did an 'easy' Royport loop thank goodness. It was about 17.5hrs on the bike that week. The next week was a bit quieter, I dusted off RooRoo in anticipation for our little trip next week and attempted the Saturday morning TT. I certainly didn't break any speed records but my power was better than ever. Go figure. Today was the Cycle for Life - 100km 'fun' ride around the coast from Clevedon. It was insanely windy and despite their reassurance that the roadworks along the course had been patched up the road was in a terrible condition. About 3-4km steep downhill in thick gravel with huge stones, I was so close to getting off and walking because I was so scared, I lost control a couple of times and almost came off. I don't know how anyone thought it would be safe for cyclists, I wouldn't have even wanted to drive my car down there. And they told us two days before that the road and been rolled and was smooth and it should be no problems for cyclists - LIARS!! That really ruined my ride, plus my chain coming off and me losing my group and having to ride solo for a bit chunk of it. Luckily I got picked up by another group which wasn't exactly fast but was better than being by myself. My end time was pretty slow but at least I got in a decent ride on a crappy day. Made my big comeback at the O'Hagan's 5km for a bit of an up-tempo run, certainly not all-out but it was still hard. It was a far cry from my 17.50 best or even my 18.40 rut but I can only get better from here. Not actually very exciting at all but in an attempt to spruce up our garden I planted some random flower seeds a while ago. Of course nothing actually grew for ages but something popped up recently, when I checked what I had planted it seems that the Cosmos plant was the only one who made it. 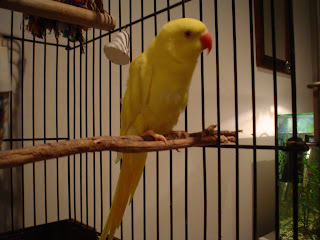 I chose Cosmos after my dear little yellow friend who I re-homed a couple of years ago. So now whenever I come home the first thing I see is Cosmo! Warm fuzzy.